You do what you can to give your children a fun-filled room that they enjoy. But the minute the lights go off, even the sweetest stuffed animals can throw some scary shadows. Are your little ones scared of the dark? Banish monsters and the Boogeyman with OXO’s portable child-safe, battery operated lamps. You’ll love how their simple, clean design fits in perfectly with modern décor. (So you know they’ll always fit in and look great, no matter what room in the house they end up in.) Your kids will appreciate their friendly bunny shapes, fun colors and comforting, warm glow. The perfect bedside companion for children of all ages, these clever luminaries are cool to the touch and free of messy cords and wires (their unique Safe Charge system has no exposed electrical components). Lift one from its charging base and it lights up instantly, ready for a trip to the potty or playhouse. Each charge lasts up to eight hours—long enough for the sun to come up. How do you deal with your children’s fear of the dark? If your kids are scared of the dark, make it less scary, I say. We have a giant seahorse-shaped night light on the wall of our little girl's room, but these would be an adorable alternative. What have you done to help your kids fight the fear? I bought these for my two young sons a year ago (they were called Candeloos back then and not from OXO, but they are clearly the same product). They are wonderful! The rechargeable batteries are long lasting, and the light emitted is bright enough for a nightlight, while not being too bright in a dark room. I would hope that now these are an OXO product, they would be a little sturdier than the ones I have. One of the lights was dropped on the floor, and the little plastic tab that keeps the LED light attached to the battery pack broke off. Without that tight connection, the light didn't work, and the only way we could repair it was to use electrical tape. :( If we could buy a replacement part, that would make us very happy, because my boys still love their "candeloos" and take them to bed with them every night. I went to the OXO site, there are a number of replacement parts for the Tooli lamps. Here's the link to that page http://oxo.com/OA_HTML/ibeCCtpSctDspRte.jsp?section=10621&minisite=10024&respid=53057 . At Daily Grommet our samples were dropped a few times (on hardwood) without any breakage but I would suggest that you contact OXO to find out if they can help. Good Luck! These would also be great for older adults. Most of us have parents (who are often getting up at night) who would find these easy to handle. Love these. So delicious. I'll let you know how it goes for inspiring the night diaper-free thing! It's a great concept and could be used for many things. reading a book under the covers, light in a room when watching a scary movie, light up a hallway to go to the bathroom. I'm a believer!! Thanks for the link to replacement parts! The part I need isn't listed on the site, but I have contacted OXO to see if it's available. Even if it isn't, we still love this product as have used it daily for more than a year. It's friendly and comforting, a real bedtime friend. You do what you can to give your children a fun-filled room that they enjoy. But the minute the lights go off, even the sweetest stuffed animals can throw some scary shadows. Are your little ones scared of the dark? Banish monsters and the Boogeyman with OXO’s portable child-safe, battery operated lamps. You’ll love how their simple, clean design fits in perfectly with modern décor. (So you know they’ll always fit in and look great, no matter what room in the house they end up in.) 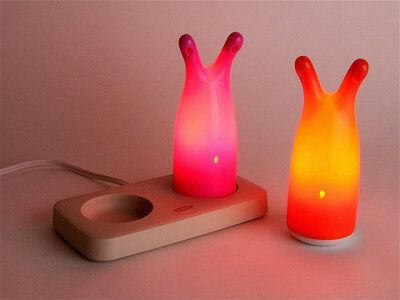 Your kids will appreciate their friendly bunny shapes, fun colors and comforting, warm glow. The perfect bedside companion for children of all ages, these clever luminaries are cool to the touch and free of messy cords and wires (their unique Safe Charge system has no exposed electrical components). Lift one from its charging base and it lights up instantly, ready for a trip to the potty or playhouse. Each charge lasts up to eight hours—long enough for the sun to come up.